Decentralisation of healthcare budgets and issuance of local guidelines means that the use of biosimilars can vary by region within a particular country, for example between the 21 counties of Sweden. This study aimed to analyse the county-level market dynamics of biosimilar and originator infliximab, which are hospital products, and to examine how local policy measures and practices, in addition to national policy, influenced market dynamics. We first conducted a literature review on (biosimilar) policies in Sweden, then analysed market data provided by IQVIA™ on uptake of originator and biosimilar infliximab within the different counties (Q2 2012 to Q4 2017), including discounts from (tender) contracts. Biosimilar market shares were calculated with volume data (measured as defined daily doses [DDDs]). We then discussed our findings in semi-structured interviews with the national pricing and reimbursement agency, key experts within the county councils of Skåne, Västra Götaland, and Stockholm, and an industry representative. Market shares of biosimilar infliximab vary widely between counties (range 18–96% in 2017). The initial uptake of biosimilar infliximab was slow and variable, with abrupt increments in biosimilar market shares coinciding with expiration of contracts for the originator product. Different approaches taken by counties to achieve a low cost per DDD of infliximab were identified, i.e., a rapid switch to the biosimilar (Skåne), a delayed switch to the biosimilar (Stockholm), or no switch to the biosimilar when a favourable price on the originator product could be obtained (Västra Götaland). Quantitative analysis showed that 59% of the variability in biosimilar market shares could be explained by the relative difference in discounted price between the biosimilar and the originator product. In addition, qualitative analysis indicated the presence of key opinion leaders, local guidelines and initiatives, and whose budget it affects as drivers in the decision-making process. Variations in the market share of biosimilar infliximab between the Swedish counties is largely explained by the discounted price difference between biosimilar and originator product, and counties used different strategies to leverage such biosimilar competition. Additionally, the presence of key opinion leaders, local guidelines and gainsharing arrangements appeared to play a role in infliximab market dynamics in counties. Arnold G. Vulto and Isabelle Huys: Joint last author. Biosimilar infliximab market shares in Swedish counties ranged from 18 to 96% in 2017. Variations in the discounted price difference between the biosimilar and originator product, and associated savings, explain variations in biosimilar uptake between counties. Counties employ different strategies to achieve low costs for treatment with infliximab. The advent of biological medicinal products, i.e. medicines produced by or extracted from a biological source, has revolutionised the treatment of many diseases by their specificity to key disease mediators, e.g., tumour necrosis factor (TNF)-α, a cytokine involved in the body’s inflammatory response . Elevated levels of TNFα are associated with diseases such as rheumatoid arthritis, psoriatic arthritis, ankylosing spondylitis, psoriasis and inflammatory bowel disease . Therefore, TNFα inhibitors, medicines that block the activity of TNFα, improved the treatment options for these diseases by reducing the inflammatory reaction. Currently, five different molecules have been proven to inhibit the action of TNFα: infliximab, etanercept, adalimumab, certolizumab pegol, and golimumab. In 2017, these molecules had combined global sales of $US39.8 billion . However, as patents and other exclusivity rights on marketed TNFα inhibitors expire, non-innovator versions, i.e., biosimilars, may enter the market. The introduction of biosimilars may create competition in this class, possibly resulting in lowered prices, and alter market dynamics in disease areas using TNFα inhibitors. In 2013, the first biosimilar of a TNFα inhibitor, biosimilar infliximab, received marketing authorisation across Europe under the names Inflectra® and Remsima® . Its originator product, Remicade®, was then one of the top three-selling biological products in the world . Marketing authorisation for other biosimilars to infliximab followed in 2016 with Flixabi® and in 2018 with Zessly®. Etanercept biosimilars Benepali® and Erelzi® received marketing authorisation in 2016 and 2017, respectively. Several biosimilars to Humira® (adalimumab) have also gained marketing authorisation. Market exclusivity rights on the originator product expired in October 2018. After marketing authorisation is received from the European Commission, it is the responsibility of the Member States to coordinate pricing, reimbursement and subsequent entry of these products to the market. This contributes to variations in the use of biosimilars across Europe . Furthermore, regional differences in the use of medicines can be observed within a country [7, 8, 9, 10, 11, 12, 13, 14]; for example, in Sweden, the Health and Medical Services Act of 1982 (updated in 2017) decentralised responsibilities for healthcare budgets and services to the 21 county councils [15, 16]. It was believed that decentralisation of the drug budget to the county councils would increase cost awareness and improve rational prescribing of medicines . By law, the 21 county councils are required to have a drug and therapeutics committee, which aims to improve rational prescribing of medicines . These drug and therapeutics committees are supported by different therapy groups or expert committees and are responsible for making recommendations on the use of medicines, including advice on purchasing of medicines and education of healthcare professionals . Although legislation, general health policy objectives, and high-level recommendations on healthcare are decided at a national level, other factors (e.g. 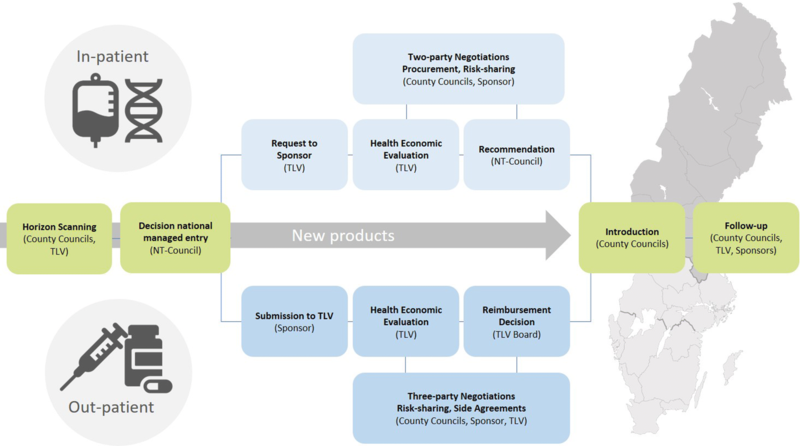 local tendering, regional recommendations) appear to play a role in the fragmented picture of market access of biosimilars in these counties and may explain regional variations in biosimilar prices and market shares. The hospital setting (e.g., infliximab) and outpatient setting (e.g., etanercept) are organised differently in Sweden (Fig. 1), providing us the opportunity to distinguish between characteristics of the setting and general driving factors that influence market dynamics. For medicines administered in the hospital setting, public procurement is carried out at the county level. The county councils finance these medicines and provide recommendations on preferred treatments . However, in special cases, the New Therapies Council can make recommendations at a national level to pursue equal treatment between the counties . On the other hand, in the outpatient setting, decisions on pricing and reimbursement of prescription medicines are made by the Dental and Pharmaceutical Benefits Agency, a governmental agency under the Ministry of Health and Social Affairs . 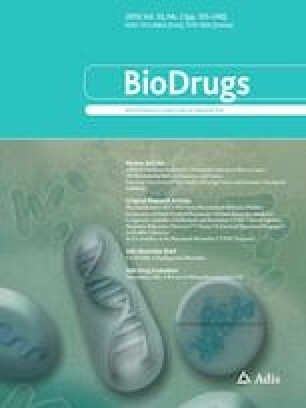 The aim of this study was to both quantitatively and qualitatively analyse the market dynamics of biosimilar and originator TNFα inhibitors in Sweden’s 21 counties and to examine how local policy measures and practices, in addition to national policy, influence market dynamics between the counties. This article is the first of two and studies regional variations in originator and biosimilar infliximab (hospital setting); the second article will discuss the market dynamics of originator and biosimilar etanercept (outpatient setting) . A comparative analysis was performed in three steps: (1) a review of the literature on (biosimilar) policies in Sweden; (2) a comparative analysis of counties’ originator and biosimilar infliximab market shares on the one hand, and of policy measures and initiatives at national and county levels on the other hand; and (3) a discussion of findings via follow-up interviews with key experts in a selection of counties. The literature review served to describe the main characteristics of the Swedish national healthcare system and policies on biosimilars, including county-level policy measures and initiatives. We searched PubMed to the end of November 2017 by combining search terms on health policy, biosimilars and Sweden. Studies could be published in English, Swedish, or Dutch. We also searched the reference lists of identified articles for other relevant studies. Articles and reports known to the authors were also included. The websites of the county councils and the Dental and Pharmaceutical Benefits Agency served as additional information sources. Market data on the uptake of originator and biosimilar infliximab in each county were provided by IQVIA™, and consisted of units, defined daily doses (DDDs), expenditure based on pharmacies’ purchase prices (prices at wholesale level) and expenditure based on discounted prices (hospital products) on different pack sizes of originator and biosimilar infliximab from quarter two of 2012 to quarter four of 2017 . Net expenditure including discounts from (tender) contracts were used to make calculations on discounted prices per DDD. Per county, graphs were drafted to show the evolution in volume (measured as DDDs) and price (measured as discounted price per DDD) over time for each originator and biosimilar product. In this way, the influence of the introduction of a biosimilar TNFα inhibitor (i.e., biosimilar infliximab) on the originator product could be studied in the context of existing policy measures. Biosimilar market shares (calculated as volume of biosimilars over volume of biosimilars and originator product) were also determined over time for the different counties. Economic theory suggests that a lower price will lead to increased uptake of a product. Therefore, we conducted a simple regression analysis using SPSS software  to test how much of the variation in biosimilar market shares between the counties could be explained by the relative difference in discounted price between the biosimilar and the originator product. A level of significance of 0.05 was adopted. 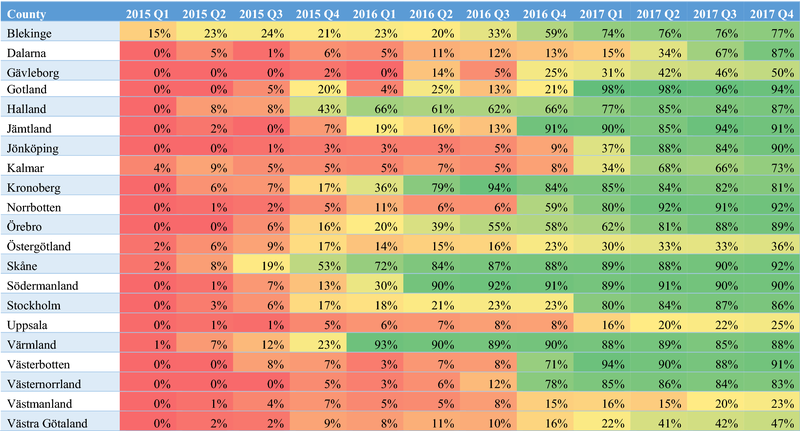 Data for 2017 were used in the analysis rather than only quarter four of 2017 (most recent data), since the data set for 2017 showed more variation in biosimilar market shares (2017: 18–96% vs. Q4 2017: 23–94% biosimilar market share). Data from earlier than 2017 were not analysed because they might reflect a still-developing market. We assumed that the prevalence of conditions for which TNFα inhibitors were used was the same in all counties . Various multiple regression models were used to study the relation between the biosimilar market share and various covariates, including the number of inhabitants per county, the number of inhabitants per procurement group, the presence of an academic hospital, the discounted price per DDD of infliximab/biosimilar/originator, the relative/absolute difference in discounted price between the biosimilar and originator product, and the geographical location. Models were compared using the adjusted determination coefficient (R2), accounting for multicollinearity and the authors’ knowledge of the Swedish healthcare system. We conducted follow-up interviews with local correspondents to discuss the results of the comparative analysis and to gain more in-depth information to add to the analysis. First, discussions were held with the national pricing and reimbursement agency (The Dental and Pharmaceutical Benefits Agency) and one county council (Stockholm). Subsequently, local interviews were conducted with five county representatives in Skåne, Västra Götaland, and Stockholm. These counties were selected based on previous analysis of literature and market data; combined, they represent > 50% of the Swedish population. County councils were contacted via email or telephone to ask whether they could refer us to their biosimilar expert for a discussion on how they approach biosimilars in their county. In addition, one interview was conducted with an industry representative to get a more comprehensive view of market dynamics in the different counties in Sweden. An interview guide was used to structure the interviews. Questions were based upon the comparative analysis of relevant literature and market data and discussions with the national pricing and reimbursement agency and were organised into two topics: general questions on the county’s policy on biosimilars and questions on the market data for infliximab. All interviewees received an email with an informed consent form to ask permission to record the interviews for data analysis. All interviews were conducted face to face in Sweden, in English, in March 2018. The recorded interviews were transcribed ad verbatim, coded, and processed using qualitative analysis. Results from the interviews were verified with the national pricing and reimbursement agency, and any outstanding questions about the Swedish healthcare system and observations during the interviews were further explored. The market share of biosimilar infliximab ranges widely across Sweden (based on volume), from 18% in Västmanland to 96% in Gotland in 2017. Table 1 shows biosimilar market shares over time for the different Swedish counties. In quarter four of 2017, two groups of counties can be distinguished: counties with biosimilar market shares of ≥ 70% and those with market shares of ≤ 50%. Biosimilar market shares over time for the counties show that initial uptake of biosimilar infliximab was slow and varied widely, with abrupt increments in biosimilar market shares. This is due to the procurement mechanism for infliximab, where counties might have initially still been locked into a contract for the originator product, Remicade®. Simple linear regression analysis of data from 2017 revealed that 59% of the variability in biosimilar market shares between Swedish counties was explained by the relative difference in discounted price between the biosimilar and the originator product (p ≤ 0.001). Multiple regression models combining the relative difference in cost with other independent variables were analysed but did not further explain the variations. Furthermore, a logit transformation of the outcome variable (biosimilar market share) did not influence the check of assumptions or results. A linear relationship provides a reasonable approximation when examining the scatterplot of the biosimilar market share and the relative difference in discounted price between the biosimilar and the originator product (Fig. 2), although other relationships may be applicable. However, building a predictive model was not the purpose of this study, rather it was to demonstrate the influence of the primary driver. 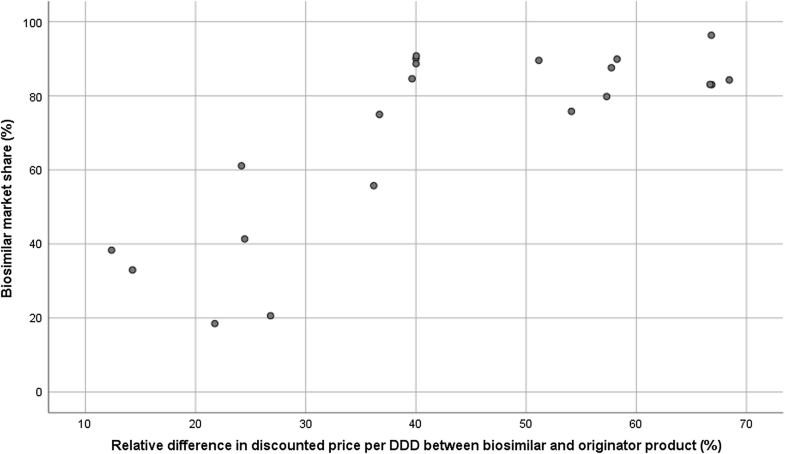 When visually analysed, a positive non-linear relationship can be seen, where the biosimilar market share rises when the relative difference in discounted price per DDD of the biosimilar versus the originator product in a county increases. This relationship then reaches a maximum: biosimilar market shares in counties exceed 76% from a threshold of a 40% difference in discounted price per DDD or more. When plotted as the absolute price difference, a difference of 50 Swedish kronor (SEK) per DDD (~ €5 per DDD) led to high biosimilar market shares (76–96%). In addition to biosimilar market shares, we also analysed discounted prices per DDD. In quarter four of 2017, the discounted price per DDD of the originator ranged from SEK59 per DDD in Västra Götaland to SEK191 per DDD in Stockholm. The discounted price per DDD of the originator increased in Stockholm in quarter one of 2017, after loss of the single-winner tender on infliximab. In Västra Götaland, the originator product was priced at the same price level as the biosimilar. In 2017, a larger variation between counties was observed in the discounted price per DDD of the originator product (SEK69–190 per DDD) than for the biosimilar (SEK59–83 per DDD). The average discounted price per DDD of infliximab in all counties decreased from SEK202 per DDD in 2012 to SEK173 per DDD in 2014 (the year before the entry of the biosimilar) and to SEK76 per DDD in 2017. Overall, in Sweden, the volume of infliximab (DDDs) increased 54% from quarter two of 2012 to quarter four of 2017 (compound annual growth rate of 8%), with more rapid escalation after the entry of the biosimilar in quarter one of 2015 (Fig. 3). Interviewees indicated that the increase in volume of infliximab could possibly be attributed to a lower threshold at which treatment is initiated (due to elimination of the price obstacle but also fewer concerns about the safety of biologicals now they have been on the market for some time), increased dosing now that prices have decreased, and more treatment-naïve patients receiving products for which a biosimilar exists. In Skåne, treatment of a patient with an expensive medicine requires consensus from two physicians. Lowered prices can therefore lead to increased autonomy in prescribing. TNFα inhibitors are available to patients in all counties, but differences might be seen in the threshold of initiation of therapy with biological medicines . TNFα inhibitors are mainly prescribed by specialists, e.g. rheumatologists, dermatologists and gastroenterologists, who also bear responsibility for switching from the originator biological to the biosimilar . On a national level, no pressure has ever been applied to switch between originator and biosimilar products. Reimbursement criteria are more binding, but adherence to these criteria is not checked with the individual counties. In general, physicians in Sweden accept biosimilars and have now accepted that the first switch is fine. During the interviews, we observed that physicians in Sweden seem to have an altruistic attitude and are aware of cost increases with innovative medicines. To begin with, this might be a consequence of the perceived high level of trust that Swedish physicians have of the European Medicines Agency and the healthcare system in Sweden. In addition, this altruistic attitude may be enabled by the way the healthcare system is organised in relatively small regions, where you can see how the money saved is used in other therapeutic areas, and the relatively low number of specialists in an area allows good communication on new guidelines and market dynamics. In Skåne, rheumatologists were advised of the county council’s decision to switch all patients receiving the originator product to the biosimilar, and the decision was explained. Furthermore, prescribing behaviour was monitored to check whether recommendations were followed (although they are not binding). Physicians were individually encouraged to adhere to the agreements. It appeared that counties leverage biosimilars to lower drug costs and make room for other patients to access treatment, thus focusing on sustainability and not just on savings. The priority for the drug budget is to make room for segments that are increasing more than others, e.g., oncology. It was acknowledged that more could be done in terms of competition and short-term savings but that this would probably upset physicians and patient organisations. Moreover, aggressive price competition may undermine the long-term sustainability of a competitive market. Interviewees identified several drivers of the decision making around using originator or biosimilar infliximab, which can differ between counties and therefore affect regional variations. These drivers are the absolute/relative difference in discounted price between the originator and biosimilar, the opinion of key opinion leaders or the preferences of the clinic head, local guidelines and initiatives in the hospital, and whose budget is affected. As the organisation of the local healthcare system, financial streams and the level at which you have budget responsibilities differ between counties, it was difficult to determine who benefited from potential cost savings. Gainsharing, where savings are shared between the payer and the hospital or prescribing physician, was suggested as a factor influencing market dynamics. In Skåne, Stockholm and Västra Götaland, savings that are made via leveraging competition of biosimilars stay within the drug budget. As budgets for hospital medicines are adjusted every year, it may be that, in the long term, the county councils benefit from savings. In Skåne, approximately half of the savings return to the hospital departments affected, e.g. for new products such as vedolizumab, and half can be used in other therapeutic areas. The hospital budget is adjusted to the predicted need. The interviewees felt loyal to the system as they always received the budget they needed when using it as efficiently as possible. In Stockholm, hospitals must pay for drugs used in the inpatient setting from their own budget and can keep savings for use in other departments. In Västra Götaland, savings would remain in the hospital in the short term but their budget may be decreased in the long term. Table 2 presents some characteristics of the infliximab market in the interviewed counties. The intention of the various counties in the tender process is to achieve a low price per DDD of infliximab. Figure 4 shows the different approaches taken by counties identified during the local interviews, i.e., a rapid switch to the biosimilar (Skåne), a delayed switch to the biosimilar (Stockholm), or no switch to the biosimilar when a favourable price on the originator product could be obtained (Västra Götaland). These approaches led to discounted prices for infliximab of SEK64, SEK78, and SEK59 per DDD, respectively, with a national mean of SEK70 per DDD and a range of SEK59–106 per DDD, in quarter four of 2017. In Stockholm, although the discounted price per DDD of the biosimilar is low (SEK59 per DDD) and the biosimilar market share is high (86%), the use of the high-priced originator in few cases has led to an overall discounted price per DDD of infliximab that is higher than in Skåne or Västra Götaland. According to the interviewees, the main criterion for awarding a contract is the price of the biosimilar or originator, since these products will not differentiate in terms of injection equipment and other criteria such as guaranteed delivery and good manufacturing practices. The duration of a tender is usually 2 years with an option to extend. As physicians do not like to switch every year, they prefer the tender duration to be as long as possible. Contracts of shorter duration can also be agreed when market conditions are expected to change in the near future, such as with the introduction of a new competitor. Some counties offer tenders in which companies can adjust prices during the tender duration. In all three interviewed counties, guidelines recommended that the most cost-effective treatment should be chosen when initiating treatment for a new patient. In Skåne, since 2014 (before the biosimilar entered the market), naïve patients were increasingly initiated on infliximab instead of other TNFα inhibitors. In early 2015, when biosimilars to infliximab were launched on the market, Skåne was locked in a contract with the originator product until July 2015. It was decided not to switch patients at that time but to start using the biosimilar in new patients. After 6 months, when preliminary information became available on the NOR-SWITCH trial (a comparative trial between patients switched from originator infliximab to biosimilar infliximab, CT-P13, and patients who maintained treatment with originator infliximab, funded by the Norwegian Ministry of Health; full results were published in 2017 ) and after consultation with colleagues, physicians in the expert group on biologicals decided to switch patients from the originator product to the less expensive biosimilar to save money. Key opinion leaders in gastroenterology supported this and had personal connections with colleagues involved in the NOR-SWITCH study. Stockholm was also locked in a contract for the originator product when biosimilar infliximab entered the market. The Stockholm county council decided to move slowly with the first infliximab biosimilars to gain experience and create trust among physicians and patients so as to move quicker on future biosimilars. Therefore, the existing contract on the originator product was extended for another 2 years (until January 2017). However, a decrease in the price of the originator product was agreed to reflect competition in the market, and a clause was included in the contract that allowed restricted use of the biosimilar. During 2015–2016, while Stockholm was still in the tender contract with the originator product, uptake of the biosimilar was higher than first expected (23%). Västra Götaland also had a contract for the originator product (from 2014 to January 2017) when biosimilar infliximab was introduced to the Swedish market. Within the contract, there was room for using other similar products, and the drug and therapeutics committee recommended that up to one-third of new patients could start with a biosimilar, since Remsima® was less expensive. In a multi-winner tender in Skåne in July 2015, the biosimilar was the least expensive product. In October 2015, the expert group on biological medicines strongly encouraged prescribing of the biosimilar, which translated into an increased volume of biosimilar infliximab. This quick uptake of the biosimilar was attributed to good connections between the different hospital departments and consultation with the rheumatology patient organisation. In Stockholm, more experience was initially gained with the biosimilar before a new tender was organised. In January 2017, a single-winner tender on infliximab was won by infliximab biosimilar Inflectra®, and all patients were switched, increasing the biosimilar market share from 23% in quarter four of 2016 to 80% in quarter one of 2017. All involved stakeholders were included in making this decision. In February 2017, Västra Götaland issued a new tender with a view to gaining a low price on both the originator product and biosimilar infliximab. Inflectra® was the least expensive product; however, as the price of the originator product was subsequently lowered to match that of the biosimilar, there has never been an economic incentive for switching. First, physicians in Västra Götaland were locked in the contract for the originator product, then the price of the originator and the biosimilar was the same; in addition, they were not in favour of switching in early 2017. When the biosimilar was the least expensive product in the tender process, active switching of patients from the originator product to the biosimilar was initiated in Skåne and Stockholm. In Skåne, different approaches for the different therapeutic indications were apparent. In rheumatology, either the physician informed the patient of a switch in treatment or a letter was given to the patient explaining what a biosimilar was, that it is as safe and effective as the originator, and what the savings would be used for (e.g. to switch back if some patients experienced problems with the biosimilar). Patients were then switched at the next appointment (approximately 6 weeks later). In gastroenterology, a letter was given to patients at the outpatient unit; after receiving it, patients could talk to a nurse or ask further questions to their physician. Most patients had a positive attitude towards this initiative and were immediately switched. Dermatology patients also received a letter at the hospital followed by an immediate switch. In Stockholm, all patients with an appointment in November or December 2016 were told that they would receive the biosimilar during the next visit (January 2017). In Västra Götaland, none of the patients were switched. Only new patients were started on the biosimilar to spread the risk of, for example, delivery problems over different products. Since the NOR-SWITCH study , physicians in Västra Götaland accept switching once in stable and well-informed patients but do not support multiple switching. A good incentive, such as a long-term substantial difference in price, would convince them to switch and overcome the associated administrative work. A good price on the originator product, as this was long their product of first choice, explains the limited use of infliximab biosimilars in Västra Götaland. Many publications only provide an overview of existing policy measures on biosimilars [27, 28, 29], therefore several authors recommended that the impact of implemented policies and practices be studied quantitatively [27, 30]. In response, this article quantifies the relation between the biosimilar market share and the net discount of the biosimilar relative to the price of the originator product. Furthermore, it provides a descriptive analysis of the evolution of market data of originator and biosimilar infliximab in the different counties of Sweden. Clarification of trends observed in market dynamics was obtained from literature and from local interviews. Table 3 summarizes the identified drivers and enablers in the Swedish healthcare system to leverage competition from biosimilars. Both the quantitative and the qualitative study revealed that increasing differences in discounted price between the biosimilar and originator product would favour the use of the least expensive product, indicating that potential savings associated with the biosimilar would incentivise stakeholders to switch from the originator product to the biosimilar. In addition, preferences of key opinion leaders also play a role in decision making and implementation, as do local guidelines and how savings will be distributed among stakeholders. Enabling factors such as a multi-stakeholder approach, an altruistic attitude of prescribers and good communication between colleagues facilitates implementation of outcomes of tender contracts and guidelines. Earlier research also noted the influence of the altruistic attitude of the Swedish population on perceptions and behaviour [31, 32]. To the best of our knowledge, this is one of the first studies to evaluate regional variations to study the effect of biosimilar policies and initiatives on market dynamics, with Sweden and its counties as a case study. Neovius et al. studied regional variations in Sweden for sales per capita of originator TNFα inhibitors. In contrast, our study includes competition by the introduction of biosimilars. Other studies also reported regional variations in biosimilar uptake in a country [9, 11, 13, 14] but did not explicitly link this to implemented policies or derived driving factors influencing the market dynamics of TNFα inhibitors. A study by Rémuzat et al. followed a similar methodology to ours when they performed a regression model analysis based on a literature review of incentive policies and analysis of biosimilar market data in ten EU member states to identify drivers of biosimilar uptake in Europe. Our study on regional variations in one country, Sweden, combines a literature review and database analysis with face-to-face discussions to explain findings. Additionally, we used net prices for the hospital market, leading to substantially different outcomes. Our study indicated a strong relationship between the biosimilar market share and the net discount of the biosimilar relative to the price of the originator product, whereas Rémuzat et al. found that the biosimilar listed price discount over the price of the originator product was not associated with biosimilar uptake. This emphasises the importance of working with actual prices rather than list prices in determining factors driving decision making. This study also showed that biosimilars for infliximab created competition in the infliximab market. Overall, we observed a decrease in the discounted price per DDD of infliximab in all counties since the introduction of the biosimilar and a concomitant increase in patients being treated with infliximab. This will benefit patients, as early treatment with biologicals will lead to improved clinical responses [34, 35, 36]. The price of a product plays a major role in choice of treatment, as illustrated by high biosimilar market shares of infliximab with increasing differences in the discounted price of the biosimilar relative to the originator product. In Västra Götaland, the market share of the biosimilar increased since its entry in quarter two of 2015 as a result of a lower price. As the price of the originator and biosimilar were set at the same level in February 2017, this leads us to expect that the biosimilar market share will not increase further during this tender period. Being the first biosimilar on the market will be an advantage, as it will be harder for subsequent biosimilars to match a similar absolute price difference with the product currently used in order to offer an incentive for counties to switch between biosimilars. It is unclear from this study what difference in price is needed to switch back from the biosimilar to the originator or to a second biosimilar, as this could not be examined. It has been illustrated that lowering drug costs is not just about uptake of the biosimilar but also about leveraging competition to alter market dynamics between biosimilar and originator products, and associated prices. The different tender groups in Sweden make the market sustainable for both originator and biosimilar infliximab. On the one hand, tenders being organised at a county level offers an advantage in that a manufacturer who does not win the bid in one county has an incentive to stay on the market by participating in tenders in other counties. On the other hand, the limited market size of individual counties may restrict the price reductions offered by manufacturers in contrast with national tenders (such as, for example, in Norway ). A concern related to the tender system is the sustainability of discounts. Although all counties want a large reduction in price, if prices are pushed to the limit, there is a risk that companies will withdraw their product from the market. In contrast to Sweden, where existing contracts can hinder market access of biosimilars, the Italian procurement law of December 2016 established a new framework for procurement of off-patent biological products. In this framework, based on therapeutic equivalence, biosimilars and originator products will compete in the same tender . Regional health authorities must open existing contracts within 60 days after launch of the biosimilar to create competition . When more than three competitors are on the market, a multi-winner regional tender is organised, after which physicians must prescribe one of the top three preferred products, except when they deem treatment of the patient should not be interrupted. This system allows immediate and direct competition between biosimilars and originator products, with promotion of the least expensive products, while maintaining physicians’ prescribing freedom. However, an advantage of the Swedish system is the increased autonomy in making decisions on a new tender, allowing the opinions of all stakeholders on the use of biosimilars and switching from the originator to the biosimilar to be aligned first. The current thinking of Swedish specialists prescribing TNFα inhibitors seems to be in line with the position statement of the Swedish Medical Products Agency, which deems treatment with a biosimilar uncontroversial in treatment-naïve patients and believes no barriers exist to switch stable, well-informed patients from the originator biological to the biosimilar [9, 40]. The position statement also indicates that more data are needed on multiple switching. To provide information from independent third parties, the Dental and Pharmaceutical Benefits Agency and the Medical Products Agency combined efforts to educate stakeholders . However, as national authorities can only recommend but the individual counties decide which products to use, this might undermine the objective of providing equal care to patients [15, 16]. On the other hand, decentralising the responsibility for providing healthcare to the county councils has the advantage that specialists and other healthcare professionals often know each other and therefore tend to follow recommendations quicker than if a national organisation announces guidance on prescribing. It has been shown that activities of the kind performed by the drug and therapeutics committees have more impact on prescribing patterns when organised at a local level and built on personal relations . An increased awareness by stakeholders on the use of taxes might have contributed to the system of solidarity and the altruistic attitude of physicians towards using the savings in other therapeutic areas. Earlier research on uptake of new medicines also identified the importance of communication between colleagues and the influence of key opinion leaders [41, 42]. Chauhan et al. concluded that the impact of clinical guidelines on uptake of new medicines has been variable, possibly due to concerns of the evidence-based nature of the guidelines and a perceived loss of autonomy by physicians. Research on the high adherence of physicians to the recommendations of the Wise List in Stockholm, which also includes guidance on the use of TNFα inhibitors, explained that a transparent development process and a multi-stakeholder approach including key opinion leaders is used to come up with sound evidence-based prescribing guidance . Other contributing factors that are mentioned are a good communication strategy, feedback to physicians, education and financial incentives. Given that healthcare systems tend to be complex and vary between countries, it may not be possible to extrapolate our findings directly to other countries. However, we believe some general drivers can be identified that can be applied in other countries to support a sustainable biological market with competition from biosimilars. Where tendering is a factor related to the system, contextual factors can be more easily adapted. Introduction of guidance on prescribing and follow-up on adherence of these guidelines can be one measure. A drug utilisation study in a region in Italy showed that guidance on prescribing granulocyte colony-stimulating factors led to an increased uptake of the less expensive biosimilar . Other measures might be consultation between stakeholders, a focus on a multi-stakeholder approach in decision making and implementation, and the introduction of gainsharing arrangements. Furthermore, experts in their field that push for the least expensive treatment option might trigger physicians to reflect on their prescribing behaviour. This study is subject to a number of limitations. First, we did not interview representatives from all 21 counties, impacting the generalizability of outcomes for Sweden. As the three interviewed counties represent > 50% of the population and > 50% of the use (volume) of infliximab, this will probably not considerably affect our results. Second, this study investigated only the biosimilar TNFα market, not the total biosimilar market. Also, no (biological) therapies other than TNFα inhibitors were considered for treatment of shared indications, e.g., abatacept, rituximab, tocilizumab. The largest shifts in market dynamics are expected to happen within the class of TNFα inhibitors. Third, regression analysis can serve to determine the influence of one variable on the biosimilar market share or to explain as much of the variation as possible. Statistical reasons, i.e. a limited number of observations, correlation between independent variables, non-linearity of the data, led us to choose a model describing the primary driver, i.e. the difference in price between the biosimilar and the originator product, accounting for net prices instead of list prices. Future research could focus on regional variations in other European countries (e.g. Spain, Italy, Germany, the UK) to investigate whether the drivers identified in this study are also applicable to other healthcare systems. A regression model could then be developed with more universal drivers predicting a high or low biosimilar market share, and factors that lead to decreases in drug costs could be identified. Furthermore, factors affecting regional variations in Sweden in healthcare services provided to residents could be further investigated to streamline best practices. This study has shown that variation in biosimilar infliximab market shares between Swedish counties is largely explained by the relative difference in discounted price between biosimilar and originator product. Visual inspection of the data suggests high uptake of the biosimilar upward of 40% difference in discounted price. Counties employed different strategies to leverage price reductions generated by biosimilar competition. The discounted price per DDD of infliximab reduced in all counties following market entry of biosimilars; this was achieved either with a lower price for biosimilar infliximab or with a large price reduction for the originator product consequent to biosimilar competition. Treatment costs associated with infliximab ranged from SEK59 to SEK106 per DDD in quarter four of 2017, implying that some counties employed more effective approaches than others to reduce prices. Factors influencing decision making may vary between counties, e.g. a large price difference between the biosimilar and the originator product, local guidelines and follow-up on adherence, presence of key opinion leaders, a head of clinic who is strongly involved in the discussion, awareness of physicians on the high costs of biological treatment, and the possibility of keeping savings and using them to treat more patients or sustain budgets in other therapeutic areas. The success of these drivers should be seen in relation to the presence of enabling factors in the Swedish hospital setting, such as a multi-stakeholder approach, an altruistic attitude of prescribers, and good communication between specialists prescribing infliximab. The authors thank Karl Arnberg and Gustaf Befrits, in their respective functions at the Dental and Pharmaceutical Benefits Agency and the Stockholm County Council, for sharing insights into the Swedish healthcare market and market dynamics on originator and biosimilar infliximab, and their valuable feedback on the manuscript. The authors also thank Björn Wettermark for critical review of the manuscript. In addition, the authors acknowledge the Leuven Biostatistics and Statistical Bioinformatics Centre for statistical advice during the project. IH, AV, SS, PT and EM developed the idea for and were involved in the design of this study. EM and AV were involved in data collection. EM drafted the initial version of the manuscript. IH, AV, SS, PT, and PD critically reviewed the manuscript. All authors read and approved the final manuscript. SS, IH and AV have conducted biosimilar research sponsored by Hospira (now Pfizer). SS was involved in a stakeholder roundtable on biosimilars sponsored by Amgen, Pfizer and MSD and has participated in an advisory board meeting for Pfizer. SS currently works with Pfizer, and works with Celltrion as a consultant to carry out biosimilar research. AV is involved in consulting, advisory work and speaking engagements for a number of companies, including AbbVie, Accord, Amgen, Biogen, EGA, Pfizer/Hospira, Mundipharma, Roche and Sandoz. PD participated in advisory board meetings for AbbVie, Amgen and Hospira and is on the speakers’ bureaux of AbbVie, Celltrion, Hospira, Merck Serono and Roche. PT is employed by IQVIA™. EM has no conflicts of interest that are directly relevant to the content of this article. The statements, findings, conclusions, views, and opinions contained and expressed herein are not necessarily those of IQVIA™ or any of its affiliated or subsidiary entities. EMA. Download medicine data. European Medicines Agency; 2019. https://www.ema.europa.eu/en/medicines/download-medicine-data. Accessed Mar 2019. Top 8 blockbuster biologicals 2013. 2014. http://www.gabionline.net/Biosimilars/General/Top-8-blockbuster-biologicals-2013. Accessed 24 Sep 2015. Hälso- och sjukvårdslag (1982:763) [The Health and Medical Service Act]. Sveriges Riksdag. 1982. https://www.riksdagen.se/sv/dokument-lagar/dokument/svensk-forfattningssamling/halso–och-sjukvardslag-1982763_sfs-1982-763. Accessed 05/2018. Hälso- och sjukvårdslag (2017:30) [The Health and Medical Service Act]. Sveriges Riksdag. 2017. https://www.riksdagen.se/sv/dokument-lagar/dokument/svensk-forfattningssamling/halso–och-sjukvardslag_sfs-2017-30. Accessed 05/2018. Lag (1996:1157) om läkemedelskommittéer [Law on drug committees]. Sveriges Riksdag. 1996. https://www.riksdagen.se/sv/dokument-lagar/dokument/svensk-forfattningssamling/lag-19961157-om-lakemedelskommitteer_sfs-1996-1157. Accessed 05/2018. In English—Tandvårds-Läkemedelförmånsverket. Tandvårds- och läkemedelsförmånsverket. 2018. https://www.tlv.se/in-english.html. Accessed 05 2018. Jorgensen KK, Olsen IC, Goll GL, Lorentzen M, Bolstad N, Haavardsholm EA et al. Switching from originator infliximab to biosimilar CT-P13 compared with maintained treatment with originator infliximab (NOR-SWITCH): a 52-week, randomised, double-blind, non-inferiority trial. Lancet. 2017. https://doi.org/10.1016/s0140-6736(17)30068-5. Rémuzat C, Kapuśniak A, Caban A, Ionescu D, Radière G, Mendoza C et al. Supply-side and demand-side policies for biosimilars: an overview in 10 European member states. J Mark Access Health Policy. 2017. https://doi.org/10.1080/20016689.2017.1307315. Biosimilar—äkemedelsverket/Swedish Medical Products Agency. Läkemedelsverket. 2017. https://lakemedelsverket.se/malgrupp/Foretag/Lakemedel/Biologiska-lakemedel/Biosimilar/. Accessed 05/2018.